Patients with non-metastatic thymoma or thymic carcinoma or with myasthenia gravis (with or without thymoma) are candidates for thymectomy. Treatment for myasthenia gravis is initiated by a neurologist, who recommends surgical treatment when indicated. Some of the common indications are: failure of medical treatment; young patients with short duration of symptoms; and patients who experience significant disability from their medical treatment. Currently, patients with ocular symptoms alone or those with symptoms that are well-controlled on medication are a controversial group for surgical resection. The American Academy of Neurology reported practice parameters in 20001. It may be beneficial to consult this practice parameter regarding controversial patient groups. All candidates for thymectomy should undergo computed tomography (CT) with contrast enhancement to look for thymoma. Myasthenic symptoms, if present, should be well-controlled by medications prior to surgical treatment. Preoperative plasmapheresis is required for the patients who cannot be stabilized by medications, and may be helpful to diminish perioperative complications and risks of myasthenic crisis in well-controlled patients. Seggia and colleagues demonstrated the perioperative value of plasmapheresis in patients with myasthenia gravis, which significantly improved respiratory function and muscle strength as well as decreased hospital cost and stay2. Gracey and others proved its effectiveness in helping wean patients off of mechanical ventilatory support3,4. For patients with myasthenia gravis a team approach including anesthesiologist, neurologist, and thoracic surgeon is highly recommended for the entire perioperative period. Patients should continue their anticholinesterase medications until the morning of surgery. Anesthetic induction should be light with only atropine and a mild sedative while avoiding the use of other anticholinergic medications. For maintaining anesthesia, the use of muscle relaxants is discouraged in favor of inhalational agents as well as short-acting narcotics. In thymic surgery for myasthenia gravis, the presence or absence of a thymoma dictates the extent of the surgical procedure required. While total thymectomy for myasthenia without thymoma can be performed through a partial sternotomy, the presence of thymoma requires a full sternotomy. 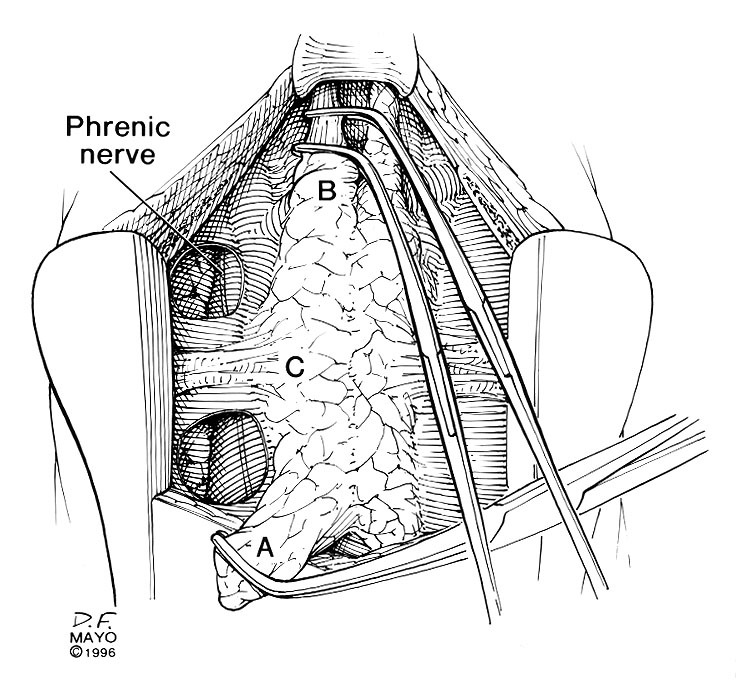 During any kind of thymic procedure, the most important step is understanding the anatomy of the phrenic nerves and their close relationship to the thymus5,6 (Figure 1). We prefer performing thymectomy through an upper partial sternal split, combining the advantages of good exposure and acceptable cosmetic results. 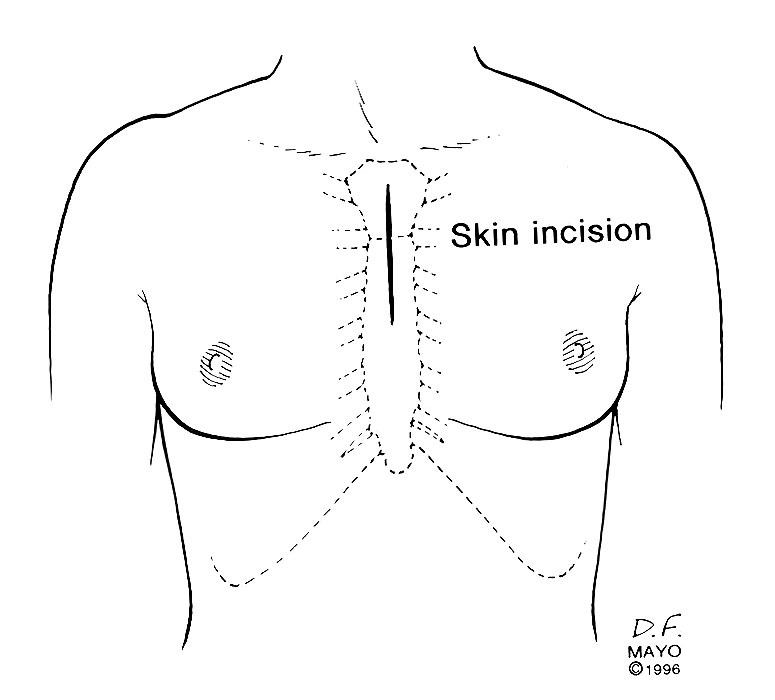 An incision is made from 1-2 cm below the sternal notch extending to the 3rd or 4th intercostal spaces (Figure 2). 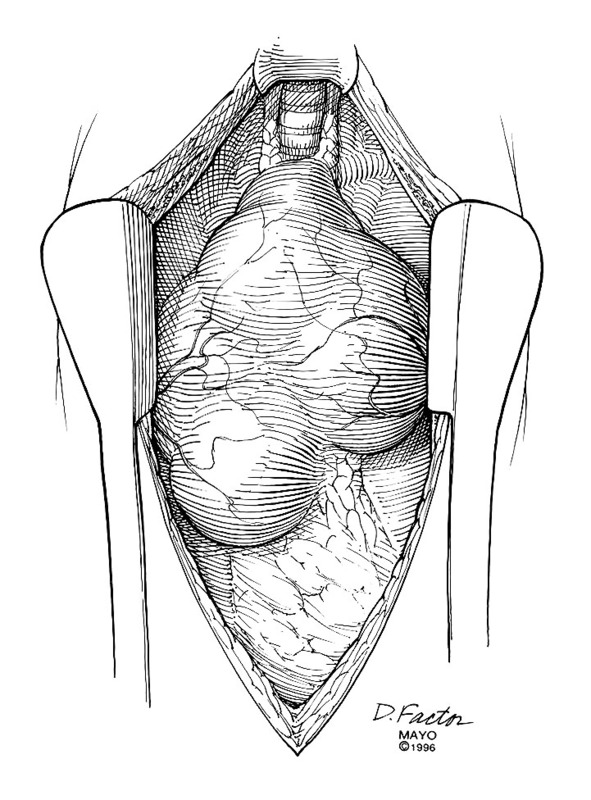 The manubrium should be completely divided and the sternotomy is carried to the level of the third or fourth interspace (Figure 3). Usually this will cause a fracture of one side of the sternum, which is stabilized at closure with the sternal wires. 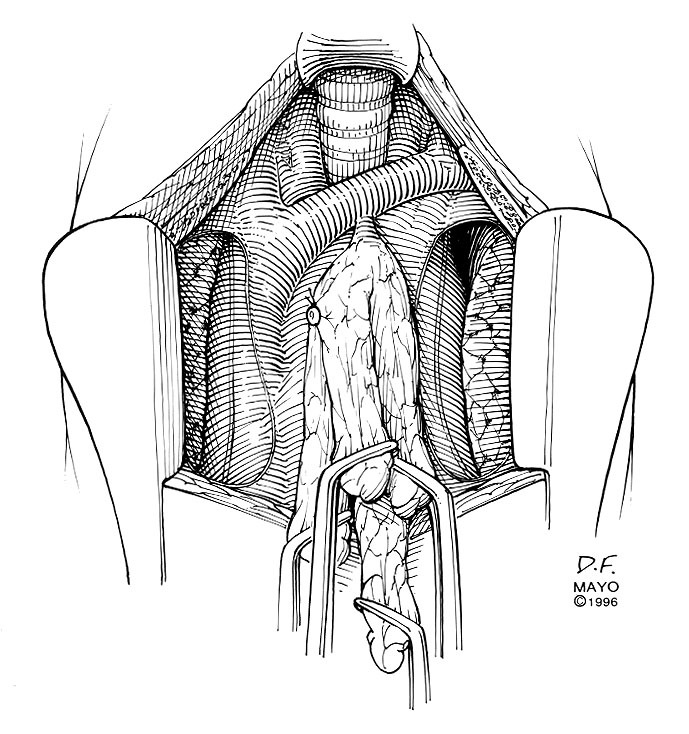 Through this relatively short skin incision, with the sternum retracted, adequate visualization of the thymus and its cervical extensions is obtained for performance of a total thymectomy. Initially both pleural spaces are opened and the phrenic nerves identified. With sharp and blunt dissection the overlying mediastinal pleurae are pushed to the sides to bring the thymus and innominate vein into view. If a thymoma is found incidentally, a complete sternotomy is usually performed. 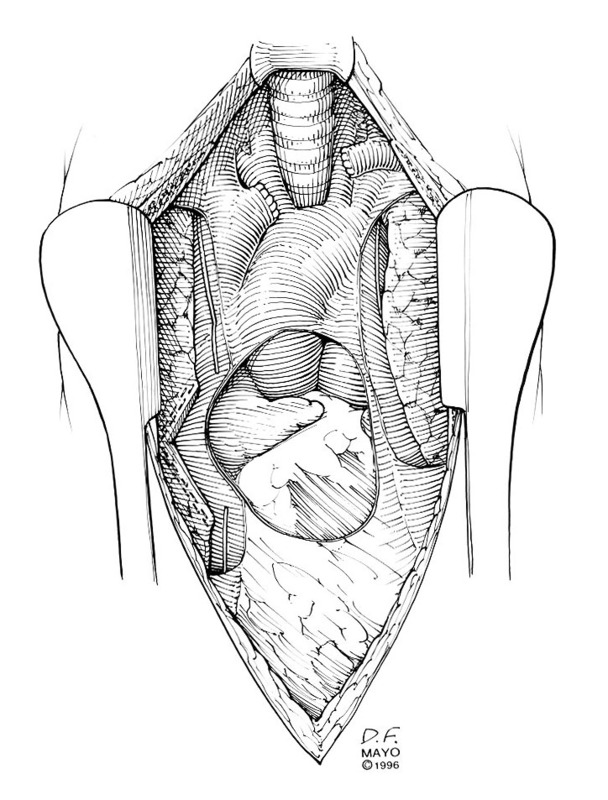 Once the anterior surface of the gland is exposed, the mobilization starts with sharp and blunt dissection of the right inferior horn off the pericardium. By using right-angled clamps a "walking technique" is utilized to elevate the most caudal portion of the horn with its associated pericardial fat pad (Figure 4). This is clamped, divided, and ligated with 2-0 silk. Once the lower horn is dissected completely off the pericardium, attention is directed to the right superior horn in the cervical area. This horn is freed circumferentially in its middle portion and, again using the right-angled "walking technique," freed from its bed until the thyrothymic ligament is identified. The horn is divided from the thyroid gland and the ligament is ligated with 3-0 silk. 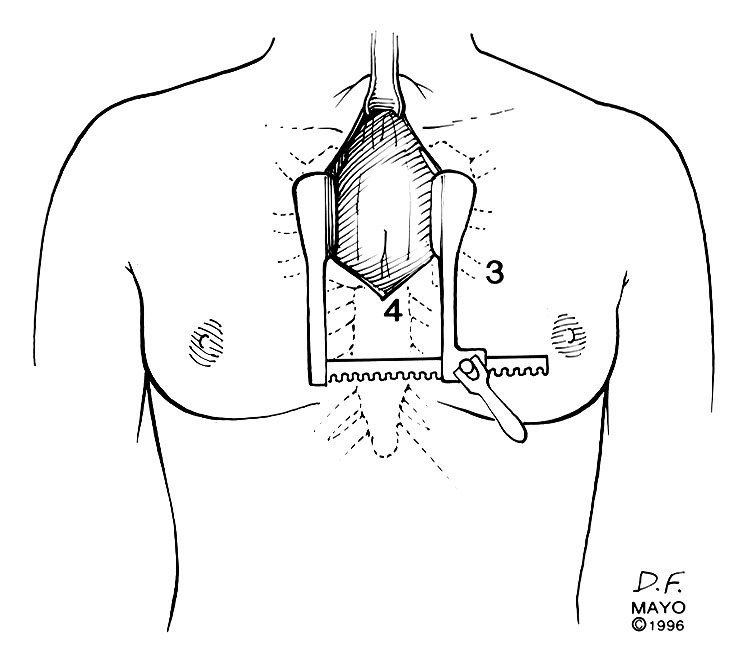 With a right-angled clamp on each horn, the thymus is retracted toward the opposite side so that the arterial supply entering laterally from the internal mammary arteries is easily identified (Figure 5). By using a right-angled clamp and blunt dissection technique, the middle portion of the right lobe and associated fatty tissue are pulled back from the area above the phrenic nerve up to the junction of the innominate vein and superior vena cava and the lateral arterial blood supply is ligated and divided. This completes one-half of the resection. The same steps are carried out on the left side. The left side can be more difficult because the phrenic nerve comes closer to the thymus. 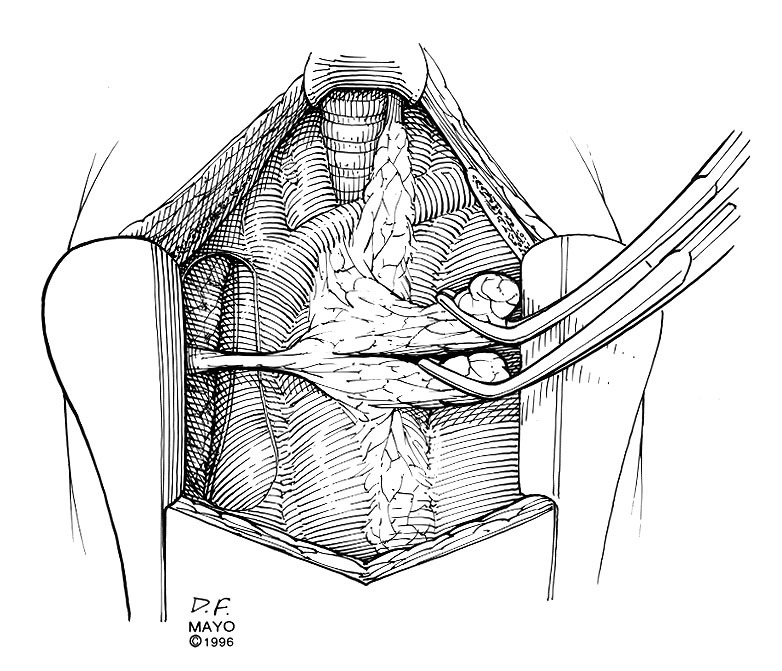 Once all four horns have been mobilized successfully, the venous drainage to the innominate vein is clamped, divided, and ligated with 3-0 silk (Figure 6). The use of clips on these vein branches is not recommended. Separate margins are taken for frozen section analysis to make sure no thymic tissue is left behind. If a thymic mass was already known or discovered during the operation, one should closely look for possible invasion of neighboring structures. If this is the case, the involved structure is removed en bloc with the thymus and the margins are to be checked with serial frozen sections. Following the resection of the gland, meticulous hemostasis is performed. It is our experience that patients who underwent plasmapheresis prior to surgery tend to have more postoperative blood loss. 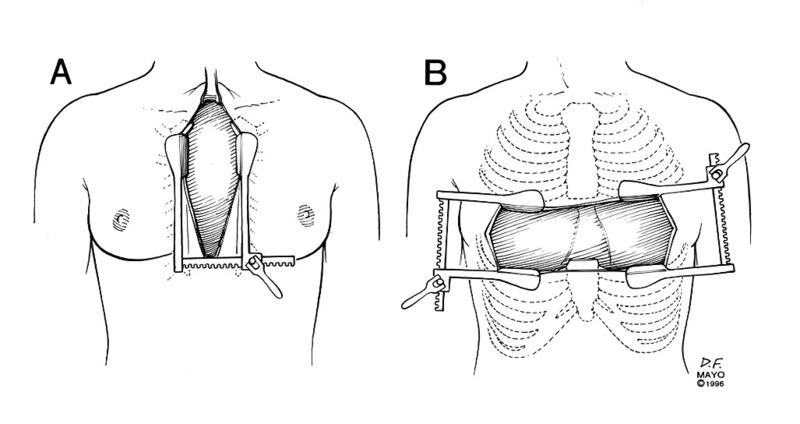 A chest tube placed from right anterior chest wall and extending to the contralateral apex via the mediastinum is adequate for postoperative drainage purposes (Figure 7). The sternum is then approximated with interrupted wires and the soft tissue and skin are closed with absorbable stitches, resulting in a relatively comfortable, cosmetically acceptable incision. Postoperatively, the patient is extubated in the recovery room, and is closely followed by the surgery and neurology teams. 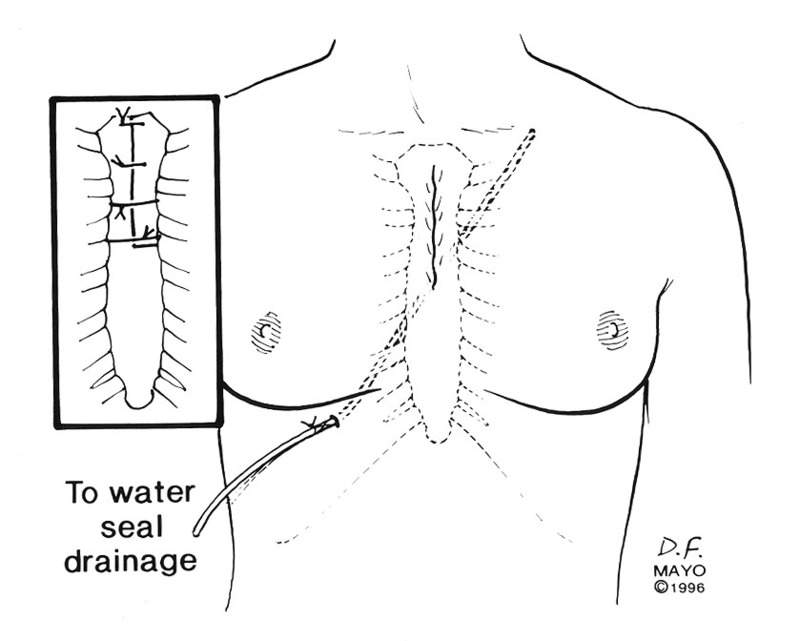 The chest tube is removed when the drainage is low. Patients may or may not be restarted on their medications depending on their clinical condition. If the patient has a thymoma found during preoperative evaluation or at surgery a full sternotomy or a "clamshell" incision is performed (Figure 8). If no invasion of surrounding structures is present a total thymectomy is performed as previously described. If the thymoma invades into the mediastinum an en bloc resection is recommended (Figure 9 left and Figure 9 right). If it is not possible to totally remove the tumor, a debulking procedure is performed and patient is considered for postoperative adjuvant therapy. Always open the pleural spaces and identify the phrenic nerves. Excellent hemostasis is recommended, especially in patients who have undergone plasmapheresis. Among 79 patients who underwent thymectomy at the Mayo Clinic between 1982 and 1985, 55 had myasthenia gravis. Forty-one of these underwent resection through a partial sternotomy, and a full sternotomy was performed in the remaining 14 patients. There was no operative mortality and 96% of patients were extubated in recovery room. Only one patient required reintubation. Complications occurred in four patients (7%) and included respiratory failure, atelectasis requiring bronchoscopy, removal of a retained drain, and chylothorax. The mean length of the hospital stay was 7.4 days but is shorter today. Lewis and colleagues reported on 274 patients treated for thymoma at the Mayo Clinic, of whom 227 underwent complete resection (7). Operative mortality was 3.1%. Complications occurred in 89 patients (39%), and were more frequent in patients with myasthenia gravis and those with cardiovascular disease. Surgical staging of a thymoma is crucial in determining the survival of the patients. Shamji and coauthors reported a five year survival rate in patients with stage I disease of 91%, stage II disease of 80%, and in stage III disease of 42% (8). Thymic carcinoma and thymic carcinoid have poor prognosis regardless of the stage of the lesion. Postoperative adjuvant therapy may be beneficial for malignant thymoma in selected cases. Gronseth GS, Barohn RJ. Practice parameter: thymectomy for autoimmune myasthenia gravis (an evidence-based review): report of the Quality Standards Subcommittee of the American Academy of Neurology. Neurology 2000;55:7. Seggia JC, Abreu P, Takatani M. Plasmapheresis as preparatory method for thymectomy in myasthenia gravis. Arq Neuropsiquiatr 1995;53:411. Gracey DR, Howard FM Jr, Dirvetie MB. Plasmaphresis in the treatment of ventilator dependent myasthenia gravis. J Thorac Cardiovasc Surg 1984;85:739. Gracey DR, Dirvetie MB, Howard FM Jr, Payne WS. Postoperative respiratory care after transsternal thymectomy in myasthenia gravis: a 3-year experience in 53 patients. Chest 1984;86:67. Trastek VF, Payne WS. 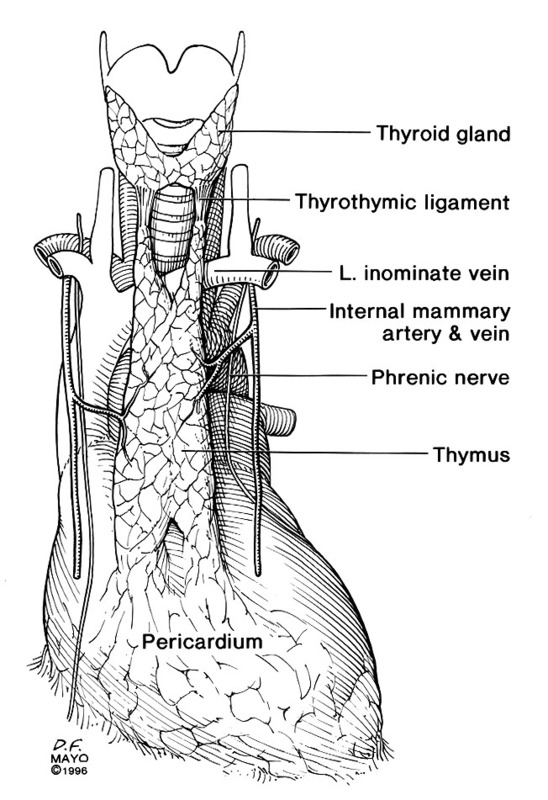 Surgery of the thymus gland. In Shields TW (ed): General Thoracic Surgery (4th ed). Baltimore: Williams & Wilkins, 1994, p 1124. Trastek VF. Thymectomy. In Kaiser LR, Kron IL, and Spray TL (eds): Mastery of Cardiothoracic Surgery. Philadelphia, Lippincott-Raven Publishers, 1998, p 105. Lewis JE, Wick MR, Scheithauer BW, Bernatz PE, Taylor WF. Thymoma: a clinicopathologic review. Cancer 1987;60:2727. Shamji F, Pearson FG, Todd TRJ, Ginsberg RJ, Ilves R, Cooper JD. Results of surgical treatment of thymoma. J Thorac Cardiovasc Surg 1984;87:43 .